Produced by the Morgantown Glass Company in the period when they were known as the Morgantown Glass Guild which started in 1933, this is the 7 1/4 inch tall 28 oz. footed pitcher in the Peacock Blue color. The highest point of the pitcher near the spout is actually a bit taller at 7 3/4 inches. This line in transparant colors started in the 1950s. By 1958, it had been renamed the Decor line, which was the brainchild of J. Richard Haden who along with his brother Samuel K. took over the business from their father Joseph Haden. In 1958, the first Decor by Morgantown" catalog was published. However, when the Carbone Company of Boston, one of the major national Importers assumed the line as their own in the early Sixties, the line became known as Crinkle. This line can be seen and is well presented on pages 214-215 of Jerry Gallagher's Handbook of Old Morgantown Glass (1995). 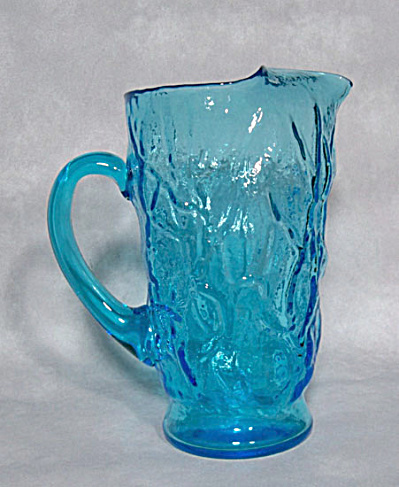 This 28 ounce pitcher is in the Peacock Blue color, one of the harder colors to find in this line. It is in excellent condition and ready to join your Mid-century home as you serve lemonade or iced tea on the veranda or patio (such great mid century terms).